What parameters would be valuable to users of online dictionaries? Is history of a word important to you? I guess most don’t care when and how the word originated. I don’t, at least. Do you care for pronunciation? Certainly more than history. People care the most for meaning(s) of the word and how it is used in sentences. Pronunciation too is a popular destination. People also care about idioms and phrasal verbs associated with the word. Some also look for synonymous. And last, because it’s all online, people want a good user experience. User experience, however, is worthless if a dictionary misses out on core offering of meaning, examples, pronunciation, and phrasal verbs & idioms. Good dictionaries not just cover all the use cases of such words, but they also do a good job of presenting so much of information in a user-friendly manner. Does the search bar in the dictionary autosuggests when you start typing a word? 2A. How common are error messages (mainly for phrases and idioms)? Does the internal search algorithm of the dictionary catches the right word even if you don’t key in the word/ phrase correctly? Remember, what happens if you key in a wrong search string on Google. It doesn’t show an error. It shows what it thinks you intended to search. Well, we aren’t expecting the same level of sophistry from dictionaries, but fewer error messages would make for a good user experience. Error messages are relatively more common while searching for phrases and idioms. If you don’t recall the exact phrase or idiom you’re looking for – which is often the case – you may type in a close string of words in the dictionary’s search box. It shows result for ‘walk before one can run’, which is the same as ‘learn to walk before you learn’. Having said that, this dictionary too fails on few close-but-not-exact strings. 2B. Does the dictionary suggest the word you intended to search in case you don’t type in the correct string? It suggests ‘leave a bad taste in one’s mouth’ which is what I was looking for. Here there is just one suggestion (which happen to be the correct one), but sometimes there could be few. Let’s start with the first dictionary. It does the best job of user experience. Examples are neatly arranged in expandable tabs after each meaning, the best I’ve seen. Surprisingly, pronunciation is at the bottom of the page. Also, British and American pronunciations are not on the same page and need to be accessed through different pages. Both are minor itches, though. You can click these tabs to unfurl the huge repository of examples for each use case of a word. This dictionary does the best job of examples too. They provide plenty of examples, by and large the most for the dictionaries covered in this post. They could’ve, however, improved user experience in examples by highlighting (bold or underline) the word in question for quick pinpointing. Cambridge English Dictionary does this. Audio of the pronunciation is a must in any dictionary, but the non-phonetic form too is helpful. 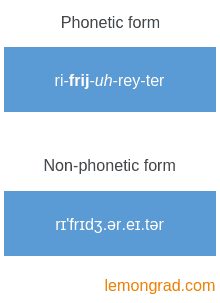 While most dictionaries carry phonetic form, only few (dictionary.com, for example) carry non-phonetic form. Pronunciation comes right at the end of the page. 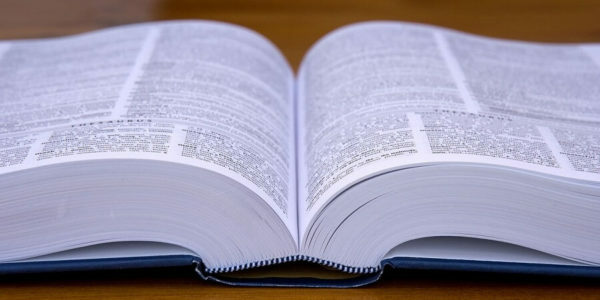 The dictionary has both American and British pronunciations, but they need to be accessed through different pages, which doesn’t matter much to most because people mainly refer to one type of dictionary – British or American. This dictionary, however, lacks in non-phonetic pronunciation. 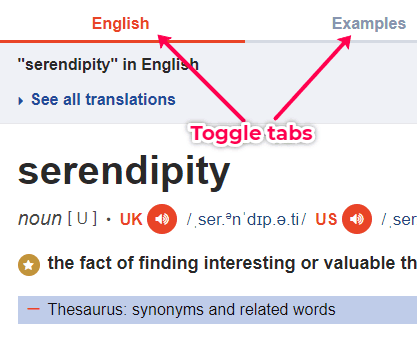 Toggle tabs right at the top helps you jump between meaning of the word and examples. By and large, words have lots of examples to go with. The dictionary, however, has far fewer examples for idioms and phrasal verbs, which is not a big irritant because most users are looking for words alone. This dictionary has both British and American pronunciations right at the top in the audio and phonetic form. Non-phonetic form, however, isn’t there. 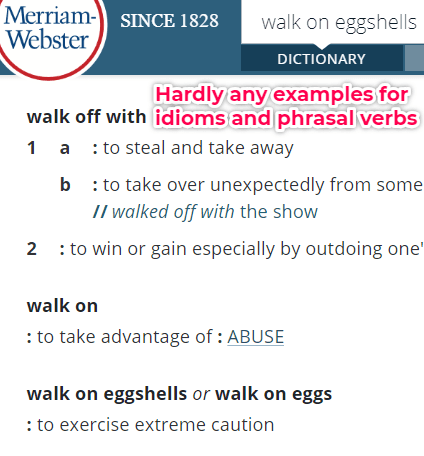 If a word has phrasal verbs and idioms (not all words have phrasal verbs and idioms), links to them are listed at the bottom of that word page. You may click these links to explore them in detail. Longman loses little bit on user experience. Scrolling the page can be bit overwhelming for common words such as ‘roll’ which have lots of use cases. At times, too much information has been packed in. Toggle tabs help you jump between examples, synonyms, and origin. It doesn’t neatly categorizes phrasal verbs and idioms. The dictionary offers an impressive array of examples. You can listen to both American and British pronunciations right at the top. The non-phonetic form (it has phonetic form) would have made it probably the perfect pronunciation destination. They’re there, but not categorized well. Its overall look & feel is average, few notches below Cambridge and Oxford dictionaries. 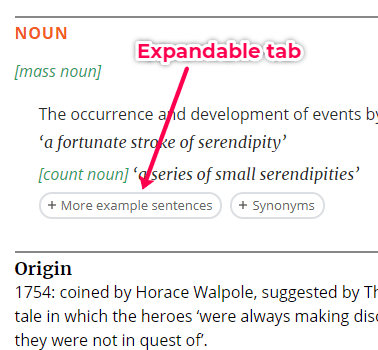 Toggle tabs right at the top helps you jump between examples, synonyms, and word origin. The dictionary has decent number of examples. One or two examples are mentioned along with the meaning of the word and the rest are clubbed together under ‘Examples’ tab. 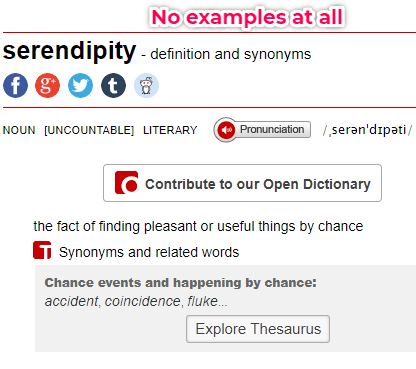 If a word is used in multiple ways, then you’ll have to make some effort to understand which example corresponds to which use for examples clubbed under the ‘Examples’ tab. Oxford does the best job of this where they segregate examples as per the use of the word under tabs we saw earlier. Having said that, I don’t see this as a problem. You can find both British and American pronunciation at the same place right at the top. 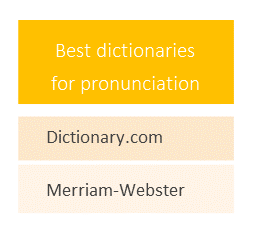 (However, if they’re pronounced the same way, you’ll find it listed only one.) The dictionary really stands out on pronunciation front as it also offers non-phonetic form of pronunciation, which is far more intuitive than the phonetic form. You’ll find few idioms and phrases after the meaning of the word in its different forms (noun, verb, adjective etc.). Plenty more of them will come at the bottom of the page. It contains good number of examples. It provides links to related idioms and phrasal verbs. However, examples here aren’t as rich as in, say, Oxford Dictionary we covered earlier. Text seems bit cramped because of lack of enough white spaces. You’ve to really strain your eyes when the word (such as ‘roll’) has plenty of meanings. The references that accompany examples cover too much space. The dictionary can do a better job of it. Like dictionary.com, this too provides pronunciation in audio as well as non-phonetic form. The content on this dictionary is quite thin. Even the meanings of words are unusually brief. 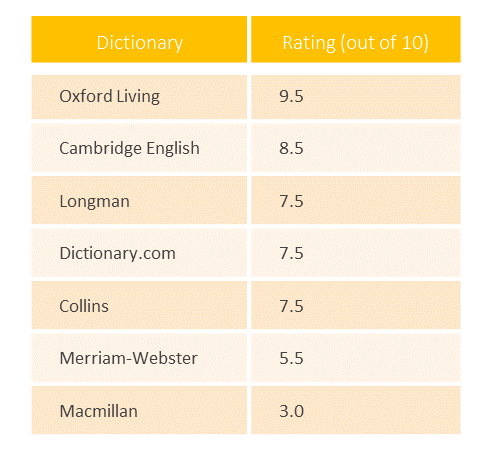 Overall user experience is just OK, but user experience is inconsequential if the core offering of the dictionary isn’t good, which is the case with Macmillan Dictionary. You can’t see the synonyms on the same page as the word. The link takes you away to another page. Only few examples. 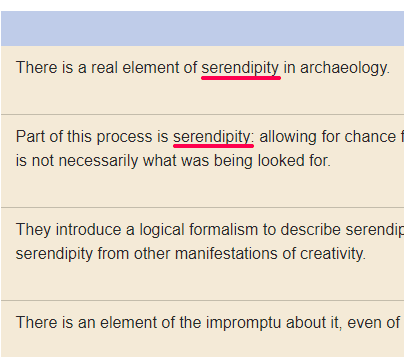 The word ‘serendipity’, for example, has no examples. 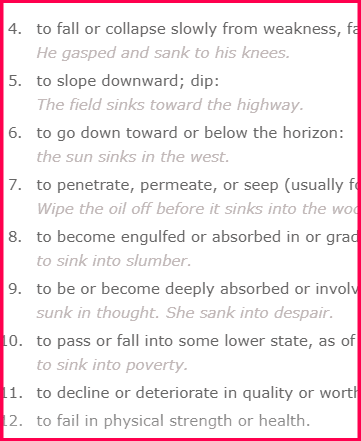 Links to idioms and phrasal verbs have been provided at the bottom of the page. However, they carry only few examples.